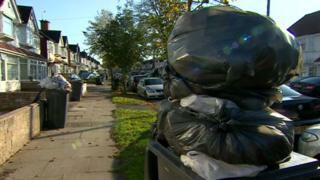 A union says it has called off Birmingham's bin strike, after a new deal was tabled. Unite has said an agreement "that meets the union's expectations" had been put on the table for the first time. Unison and Unite union members had started a series of walkouts over "secret payments" made to non-striking GMB staff after a dispute in 2017. Under new plans, workers would receive £3,500 payments that the council said would end disputes with Unite. The authority added the waste collection service would be "back to normal" the week after next. Temporary arrangements, including fortnightly collections, will continue next week. The planned deal, which was recommended for approval on Friday, will now go before another cabinet meeting for a final decision on 15 March. Unite had said Friday's scheduled action was suspended partly to allow the city council's cabinet to discuss the proposed offer. Unions and the authority have been in a dispute since December over claims that GMB union members, who did not take part in previous strikes in 2017, had been given extra payments by the council. Work to rule and an overtime ban began on 29 December 2018 and strike action, due to have been two days a week for five weeks, started on 19 February, although there have only been three days of action. Council leader Ian Ward said a sum of £3,000 was previously in a cabinet report and there was a figure of £500 "to end all litigation and all disputes that are currently under way" between Unite and the authority. Mr Ward said there was "a determination on all sides that we'll move forward" to deliver a service that people "deserve". Crews would be deployed on two weekends, on 16, 17, 23 and 24 March, "to deal with the backlog", he stated. Before Friday's council meeting, Unite assistant general secretary Howard Beckett said it was "imperative" the cabinet "signs up to the deal". He said: "The heads of settlement (agreement) is a real breakthrough in negotiations. "I am sure that Birmingham residents will be keeping their fingers crossed that the cabinet does the right thing and this long-running dispute is finally brought to a close."